iTunes Radio, Apple’s first real foray into streaming music, made its public debut back in June 2013, where it was announced alongside iOS 7. Over a year since its release, the service hasn’t exactly taken over the world, quite literally. It’s still only available in the United States and Australia. If you compared iTunes Radio today with iTunes Radio as it existed the day it was first available to use, you’ll notice that not much has really changed. Of course, just last May, Apple announced its acquisition of Beats Electronics, which brought along with it Beats Music, a robust and almost entirely different approach to streaming music. While Apple may seek to integrate Beats Music more tightly with iTunes in the future, at this time it hasn’t. So in the meantime, what could Apple do to make iTunes Radio more appealing to customers? Some might say the music selection is limited, or that streaming doesn’t always work correctly. However, focusing on the service strictly from a feature standpoint, there are many small changes and additions Apple could implement that would have a huge impact on the usefulness and utility of iTunes Radio. Let’s take a look. Playing music is obviously the most important part of any music service, and therefore deserves the most attention. A refresh to the user interface of iTunes Radio could put your music front and center. As can be seen in the mockup above, saved stations are laid out in a horizontal scrolling list below a brand new immersive now playing panel. Featured stations have been moved to an all new “Explore” tab, which we’ll take a look at later. iTunes Radio itself has been separated from the music grouping on the Mac, and given its own button in the top left corner. The new now playing panel lists a wide variety of information about the currently playing track. Full lyrics, an artist biography, and related artists could all be included here, which makes discovering new artists as well as exploring more music by the same artist simple. Buying the current track is easy in the new now playing panel. This same information could easily be made available on iOS, simply by tapping the info button on the now playing screen in the Music app. The current system for finding new stations and artists in iTunes Radio is unorganized and hard to discover in some cases. With a totally new “Explore” section on both the Mac and in iOS, finding new music could be much more intuitive. The imagined new Explore section separates different types of stations into different sections. Right now, the featured stations listing in iTunes Radio is simply a conglomerate of popular stations, like “iTunes Pure Pop”, top stations, like “iTunes Weekly Top 50 Hip-Hop”, and limited time stations, like “The 57th Grammy Awards.” With a more in-depth Explore panel, there is room to separate these stations into organized categories, as well as include sections listing stations by Genre, the most popular stations right now, as even Genius recommended stations based on your listening history. Last but not least is the wish list. Apple’s implementation of the wish list on iOS is already pretty well done, but I think that the Mac could use some attention. Currently, you can access your wish list through the account button on the iTunes title bar, but bringing it directly into the iTunes Radio interface makes it easier to go back to previously bookmarked songs and purchase them. Along with the standard wish list, preview history, and Siri history, your iTunes Radio play history, which is currently bundled into the Up Next menu, could also fit here easily. 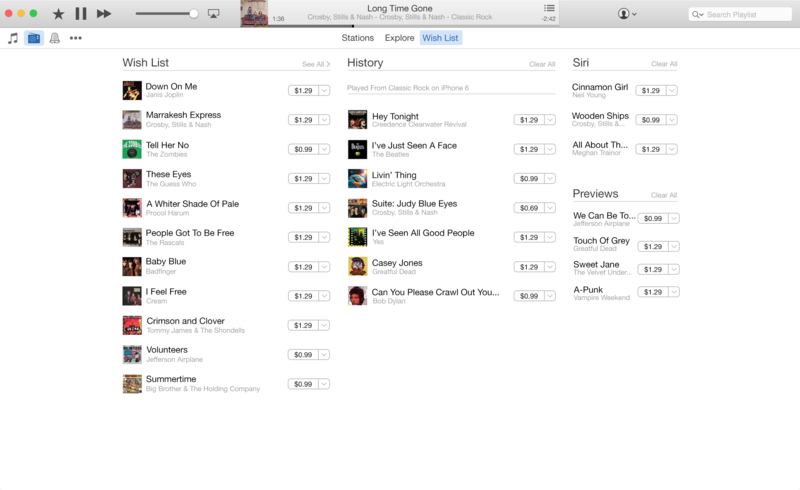 iTunes Radio as it exists today is a sparse, but solid platform to build off of. With some relatively minor functionality and user interface changes, it can become a much more modern and full featured streaming service that appeals to a much wider variety of users through better music discovery and easier purchasing. It’ll be interesting to see how Apple integrates the Beats brand into their existing music services over the coming months and years in pursuit of a better streaming platform.